Spring constellations are the constellations that are best seen in the evening night sky from late March to late June in the northern hemisphere and from late September to late December in the southern hemisphere. The most prominent northern spring constellations are Ursa Major, Boötes, Leo, Cancer, Virgo and Hydra. The constellations Centaurus and Crux, which dominate the night sky in the southern hemisphere, can be seen from tropical latitudes north of the equator, but are invisible to observers living north of latitudes 25°N and 20°N respectively. For northern observers who can see these constellations, spring is the best time of year to observe them. Hydra, Virgo and Ursa Major are the three largest constellations in the sky, with each occupying more than 1,200 square degrees. With a shape that resembles a twisting snake, Hydra is also one of the longest constellations, measuring more than 100 degrees from its southern tip, which borders Libra and Centaurus, to its northernmost point on the border with Cancer. Despite its size of 1,303 square degrees, Hydra is not particularly prominent in the sky. Its brightest star, the orange giant Alphard, has an apparent magnitude of 2.00 and second brightest star, Gamma Hydrae, is a full magnitude dimmer. Hydra is home to three Messier objects: the open cluster Messier 48, the barred spiral galaxy Messier 83 (Southern Pinwheel Galaxy), and the globular cluster Messier 68. The constellation is visible from most locations in the southern hemisphere, but cannot be seen north of latitude 54°N. The zodiac constellation Virgo has a considerably larger number of notable features that can be seen in a backyard telescope. Spica, the constellation’s brightest star, is the 16th brightest star in the sky and can easily be located by following the arc of the Big Dipper’s handle. It is the second bright star along this imaginary line, after Arcturus. Spica forms the Spring Triangle with Arcturus and Regulus and is also part of the Great Diamond asterism along with Arcturus, Cor Caroli and Denebola. The Virgo Cluster of galaxies, spread across the constellations Virgo and Coma Berenices, contains about 2,000 galaxies, including the bright Messier 49, Messier 58, Messier 59, Messier 60, Messier 61, Messier 84, Messier 86, Messier 87, Messier 89 and Messier 90 in Virgo and Messier 85, Messier 88, Messier 91, Messier 98, Messier 99 and Messier 100 in Coma Berenices. The center of the cluster is located between the stars Denebola in Leo and Vindemiatrix in Virgo constellation. The famous Sombrero Galaxy (M104) also lies in Virgo, near the border with Corvus, but it is not a member of the cluster. Other Messier objects in Coma Berenices include the Black Eye Galaxy (M64) and the globular cluster Messier 53. 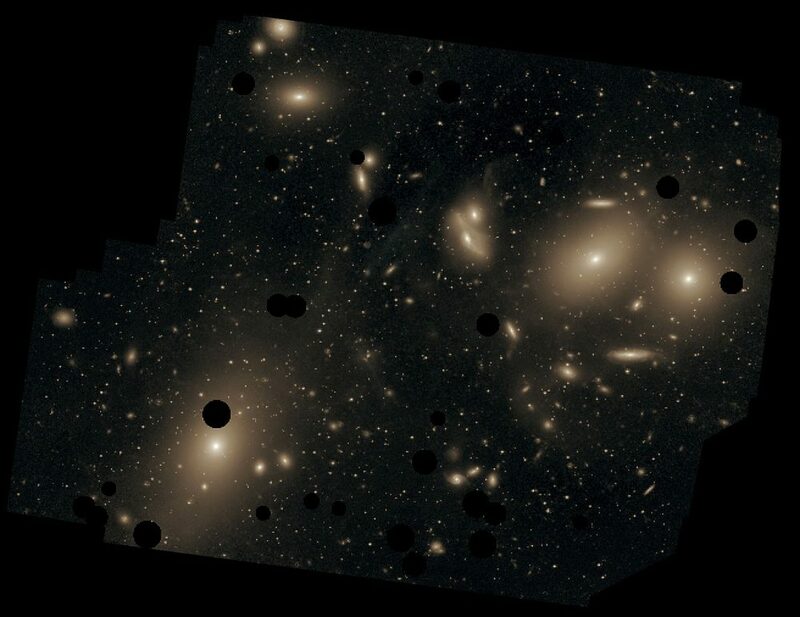 This deep image of the Virgo Cluster obtained by Chris Mihos and his colleagues using the Burrell Schmidt telescope shows the diffuse light between the galaxies belonging to the cluster. North is up, east to the left. The dark spots indicate where bright foreground stars were removed from the image. Messier 87 is the largest galaxy in the picture (lower left). Boötes, one of the largest northern constellations, contains Arcturus, the brightest star in the northern celestial hemisphere. Visible to all observers living north of latitude 50°S, the constellation is easy to spot, with 29 stars visible to the naked eye and the prominent Kite asterism visible between the easily recognizable Corona Borealis, the Northern Crown, and the stars of the Big Dipper. Boötes contains several multiple stars that are popular among amateur astronomers. Izar, or Epsilon Boötis, is one of the stars that form the Kite. It is a close triple star system famous for its contrasting colours. Alkalurops, or Mu Boötis, is another relatively bright triple star, and Xi Boötis is a quadruple star system. 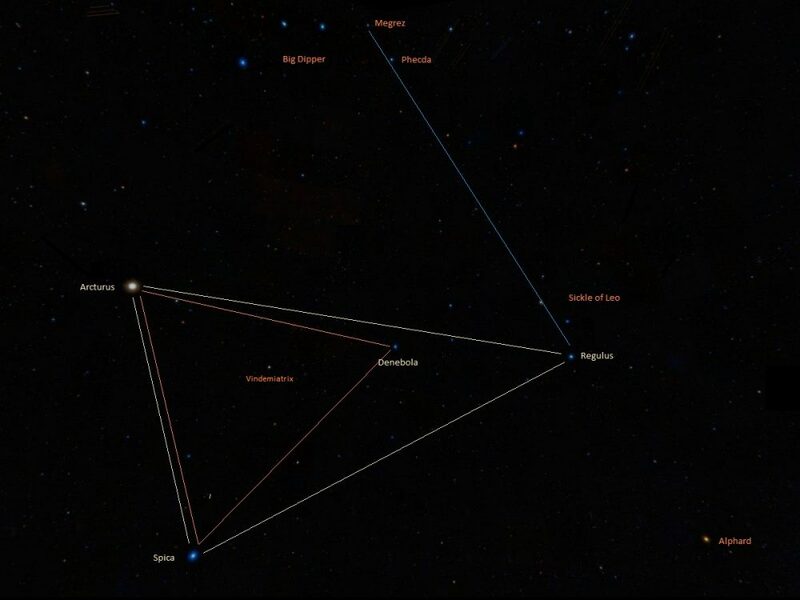 Finding Arcturus in the night sky. Ursa Major, the Great Bear, is one of the best known constellations in the sky. Visible to northern observers throughout the year, the constellation is primarily known for the Big Dipper asterism, formed by its seven brightest stars. Ursa Major contains a number of interesting deep sky objects, including several Messier galaxies – Bode’s Galaxy (M81), Cigar Galaxy (M82), Pinwheel Galaxy (M101), Surfboard Galaxy (M108) and the barred spiral galaxy Messier 109 – and the Owl Nebula (M97). The stars Merak and Dubhe, which mark the front of the Dipper’s bowl, are known as the Pointers because they point the way to Polaris, the star that indicates true north, located in Ursa Minor. Leo constellation is easy to find because some of its brightest stars form an asterism known as the Sickle, which looks like a backwards question mark. Regulus, the constellation’s brightest star, sits at the base of the asterism, marking the celestial lion’s heart. Denebola, which marks the lion’s tail, is the second brightest star in Leo and located on the opposite side of the constellation, in the direction of Virgo. Several bright galaxies can be seen between the two stars, including the Leo Triplet – consisting of the Messier galaxies M65 and M66 and the Hamburger Galaxy (NGC 3628) – the spiral galaxies Messier 95 and Messier 96, and the elliptical galaxy Messier 105. 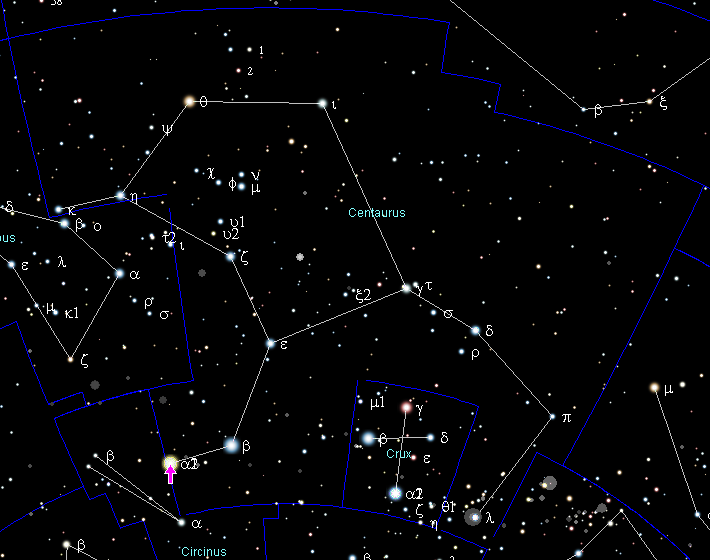 Centaurus, invisible to observers north of tropical latitudes, is one of the largest, brightest and oldest constellations. It is home to Alpha Centauri, the closest star system to our own and third brightest star in the sky. Centaurus also contains Omega Centauri, the Milky Way’s largest and brightest globular cluster, visible to the naked eye at magnitude 3.7, and the bright starburst galaxy Centaurus A, one of the closest radio galaxies to Earth. Hadar, Beta Centauri, is the 11th brightest star in the sky. Together, Alpha Centauri and Beta Centauri are known as the Southern Pointers because a line drawn from Alpha through Beta Centauri points the way to Gacrux, the star at the top of the Southern Cross. Gacrux, or Gamma Crucis, is the nearest red giant to the Sun. Together with Acrux, the brightest star in Crux and southernmost first magnitude star, Gacrux is used to find true south. An imaginary line drawn from Gacrux through Acrux leads to a point close to the Southern Celestial Pole. Crux is visible from April to June in tropical latitudes, but invisible to observers north of latitude 20°N. The constellation contains several notable deep sky objects. These include the Coalsack Nebula, the most prominent and best known dark nebula in the sky, and the Jewel Box Cluster (Kappa Crucis Cluster), one of the youngest known open star clusters. Southern spring constellations, listed below, are the same as northern autumn constellations.